The U.S. flu season is fast approaching, and people who are sick should protect themselves and others. 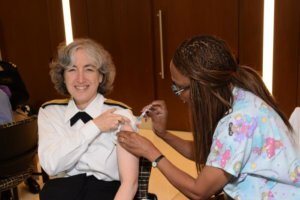 The Centers for Disease Control recommends that everyone six months and older get a seasonal flu vaccine, preferably by the end of October. Most people with the flu have mild illness and don’t need medical care or antiviral drugs. If you get sick with flu symptoms – fever, cough, sore throat, runny/stuff nose, body aches, headaches, chills, fatigue and sometimes diarrhea and vomiting – stay home, don’t travel and avoid contact with other people except to get medical care. However, if you have symptoms of flu and are in a high-risk group or if you have certain medical conditions or are very sick or worried about your illness, contact your health care provider. In addition to getting any recommended travel vaccines, make sure you and your family are up to date on all routine vaccines, such as MMR vaccine, before you travel.